After retiring from teaching physics at Miami University in Oxford, Ohio, Glenn Julian (one of the authors) took up his father’s hobby of researching family history. Julian spent nearly 10 years in researching family records, history, and land records in county libraries and deeds recorded in county court houses. 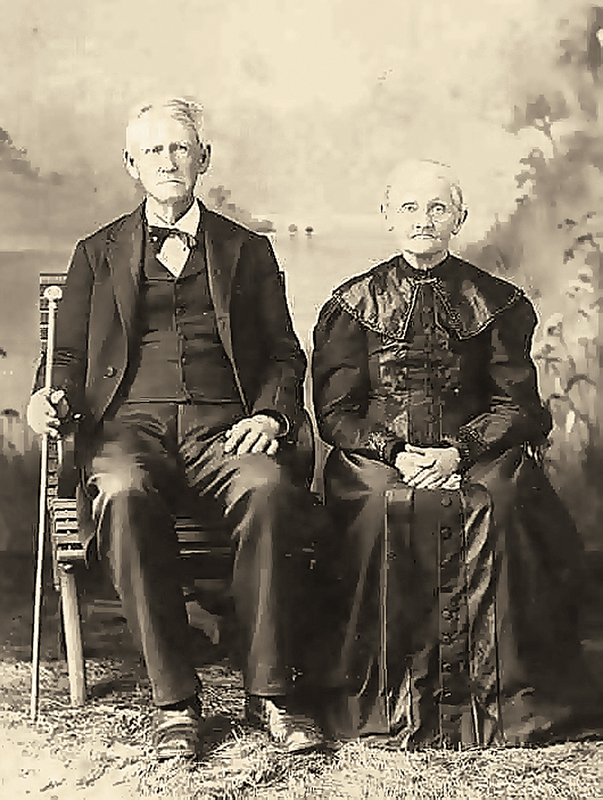 He learned that his great-great grandfather Isom Julian (1795–1885) and great-grandfather George Julian (1812–1906) moved from Rutherford County, North Carolina, to Blount County, Tennessee, about 1816. At the suggestion of a faculty colleague, Julian contacted Robbyn J. F. Abbitt for assistance in locating the farmlands of his forebears. Abbitt advises Miami University’s GISci certificate program and teaches entry- and advanced-level GIS courses with a focus on real-world applications. In these courses, students use the most current version of Esri’s ArcGIS for Desktop software (Advanced license level). For advanced students, she provides instruction and coaches students in two types of assignments: semester-long GIS projects undertaken by an individual student or by a team of three or four students, who advise a client’s major GIS project. Over a period of three semesters, individuals and teams helped trace Julian ancestors in three Tennessee counties. A team of three GIS students worked with Julian to locate his ancestors’ claims in McMinn County, which is located in the southeast corner of Tennessee. Julian’s great-great grandfather, Isom Julian, a circuit-riding Methodist Episcopal minister, was sent out as the first missionary from his church in Blount County. 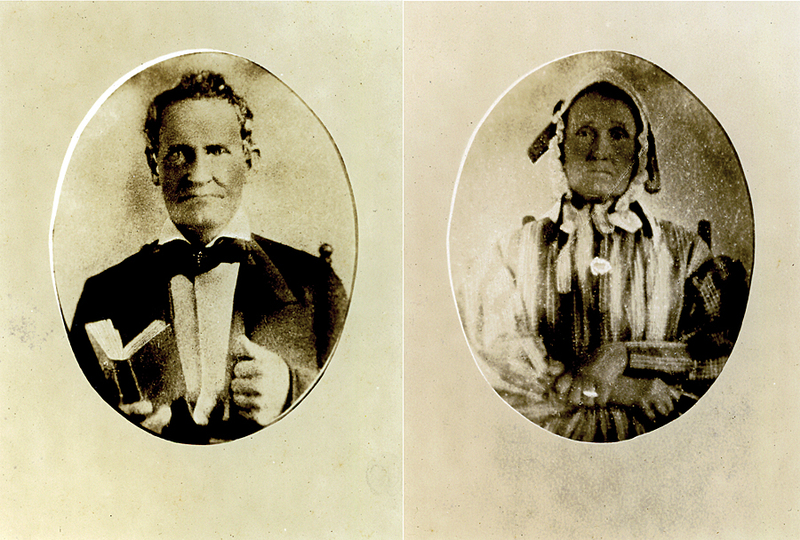 In 1833, Isom, his wife Betsey, two daughters, and four of their five sons moved to McMinn County. This was also the county where his father-in-law, Robert Patterson, had already entered a claim in 1825. Isom’s claim was described in terms of the Hiwassee Survey as the southwest quarter of Section 32 of Township 4, Range 1 East (Section 32, T4 R1E) of the north-south Principal Meridian of the Hiwassee District, which passes about three miles east of Athens, Tennessee. Julian identified the claim for the farm of Isom’s son George, who was also a circuit-riding minister. George established the claim when he married Mourning Smith in 1836. George’s son, Robert Patterson Julian, married a woman named Bond. 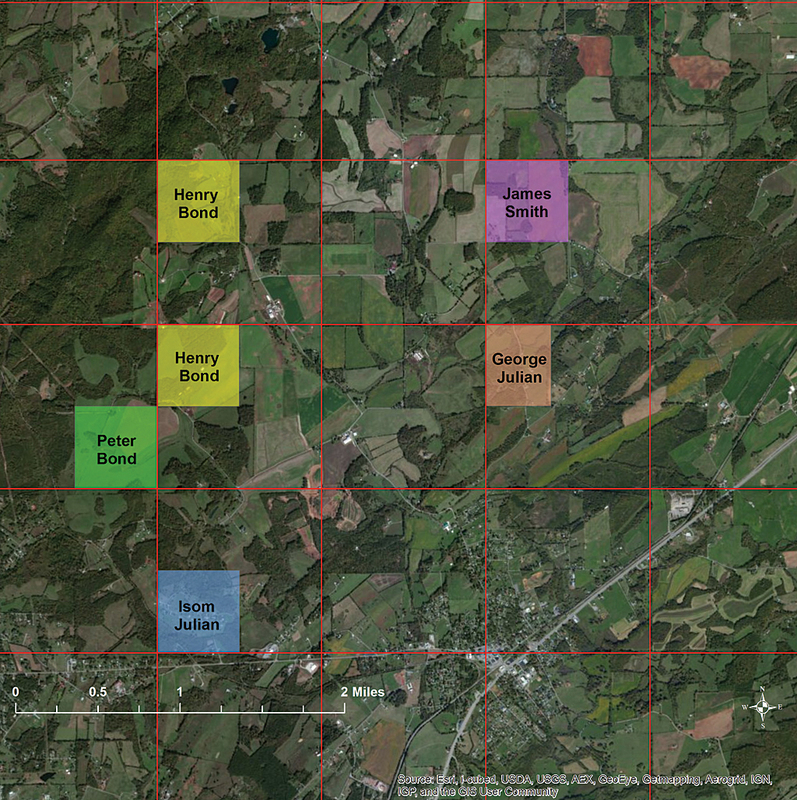 Julian found earlier claims for both the Smith and Bond farms but could not find where they were located. 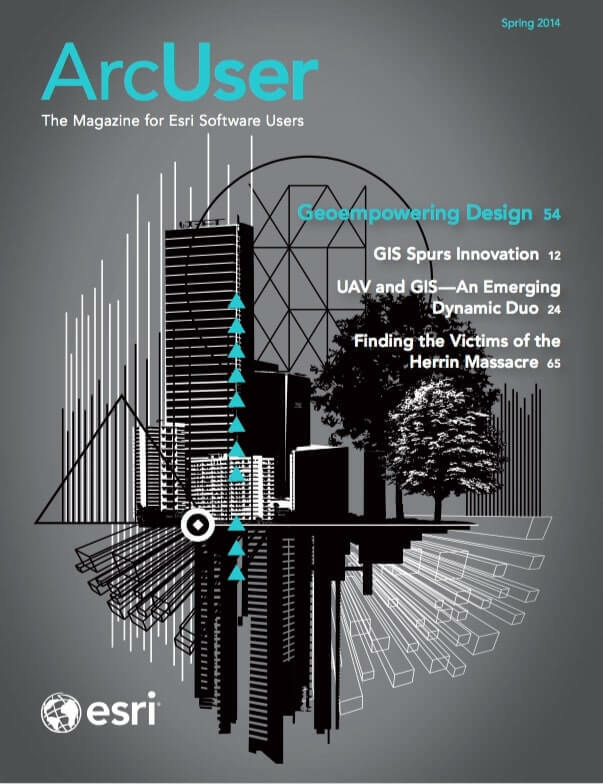 However, studying aerial images, such as Esri’s Online World Imagery basemap, revealed that the old survey lines are still visible on the ground as the borders of fields and woodlands. Although interrupted by later subdivisions, they extend for many miles in a checkerboard pattern. Pinpointing his forebears’ claims would require identifying these squares. Abbitt’s GIS students worked with him to locate these claims. They used the Create Fishnet tool in ArcMap 10.1 to create a uniform grid of polygons that were one mile square. The students then adjusted this fishnet to match the section lines on the 1994 Cherokee National Forest map. By looking at current aerial images, students could infer the locations of claims in particular sections and townships as they were numbered in 1851. This led to the inferrence that Isom’s claim was located where, today, the town of Etowah, Tennessee, stands. However, this would have meant that his ancestors farmed on the side of a mountain—not a good place for subsistence farming. Then Julian noticed that the 1825 claim by Isom’s father-in-law Robert Patterson was in T6 R1W. There was no T6 on the 1851 map. From the Tennessee State Library and Archives, Julian obtained a copy of the 1836 Tax Map for McMinn County. It showed that the numbering of townships in 1836 was different from the numbering in 1851 that was shown on the 1994 National Forest map. Julian’s father inherited one of George’s original grant documents. At the Cleveland and Chattanooga libraries in Tennessee, Julian found microfilmed records of these land grants. From the Tennessee State Library and Archives, he obtained a map (circa 1842) of the grants, but unfortunately it did not show features on the ground. However a huge, rare 1928 plat book found in the Chattanooga Public Library included both the Ocoee Survey grid and modern features on the ground in the area. It is dramatically clear from the plats that today’s roads in Tyner follow the 20-degree tilt of the Ocoee District survey. A GIS student used ArcMap to georeference the old grant map to current road intersections in a digitized image from the plat book. The georeferenced reconstruction of George’s land in and near Tyner, superimposed on a current aerial image of the area, shows that the original grants of George and his brothers were located at the site of the new Chattanooga Volkswagen plant. The Hamilton County study was the first one performed. It was carried out by an individual undergraduate student who was a botany major. The other two studies of McMinn and Bradley Counties used a team approach. Abbitt formed each team a few weeks into the semester after assessing the students’ GIS skills. Each team had at least one graduate student. Students held one inaugural meeting with the client, worked out how they would share tasks, maintained e-mail contact with the client, and held a summary meeting with the client near the end of the semester before the final report and presentation to an audience. As with any team effort, students vary in motivation and participation, so Abbitt allowed both the client and teammates to provide some input on students’ grades.